Recently bought, or a short summertime post. It’s a very hot August in Krakow, Poland, and if you escape to the mountains on the weekend – you better start your hiking very early to avoid the scorching Sun. The caves were very cold though, yes – but muddy. So, I was supposed to write something around the last weekend, but I just couldn’t, and I have a book I want to review that will have to wait at least a week… I decided to just write a few words about my latest book-buying spree. We, who are about to die, don’t want to. Nix is big, and has been for over two decades, but I was only recently convinced he’s worth taking a look into. And, conveniently, one of my dealers had a good-looking set. Is it really a combination of old tropes done exquisitely well, with a fascinating magic system? David Anthony Durham came to my attention with his War with the Mein trilogy, but his Hannibal actually came out earlier. The first was sold as solid epic fantasy, and when the time comes to read sth of that kind – I will. 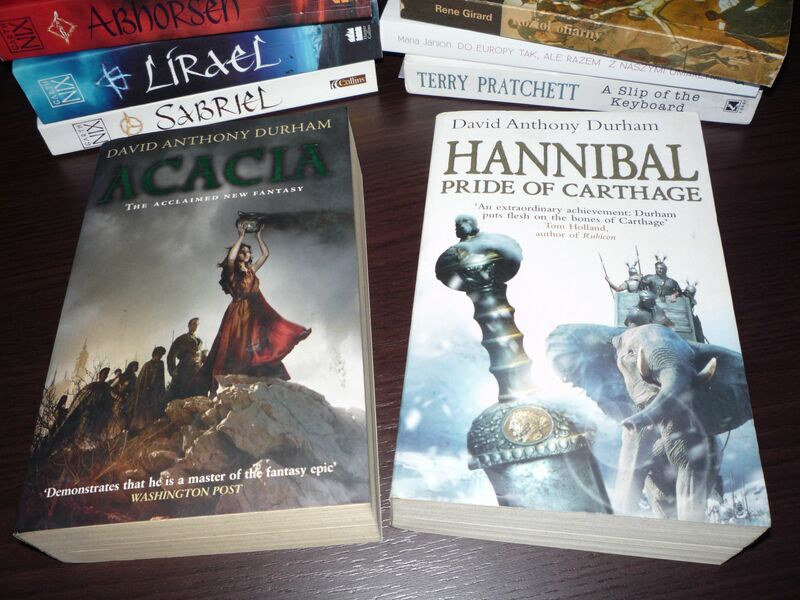 Pride of Carthage I will read sooner, I was always a great admirer of the great Carthaginian general. I’m a big fan of Ancient Rome, and its role in creating the civilization as we know it, but the story of someone who almost destroyed it at the beginning of its power – so fascinating! One of my favourite historical heroes, and I’ve read a lot about him already, but nothing lately. Only, I already feel melancholic, knowing how it will end… a reader of history encounters the same tragedies, time and time again. 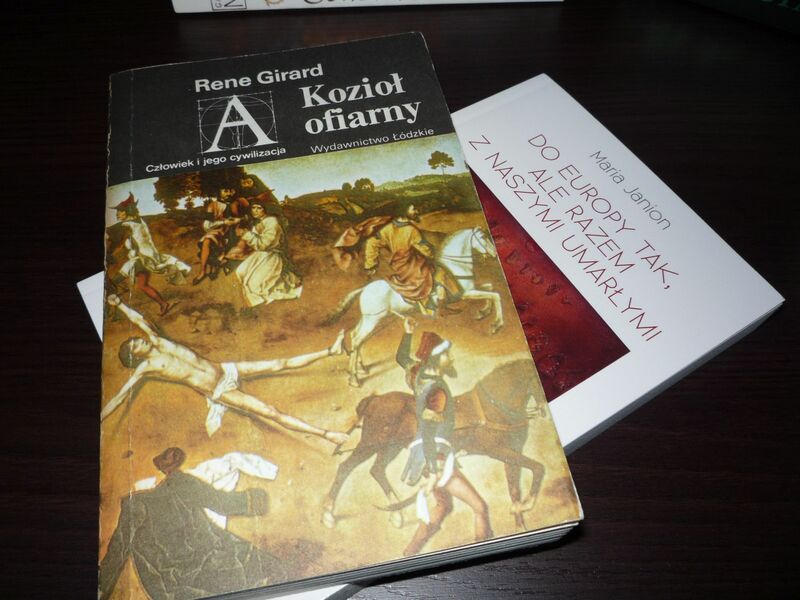 The final two books are in Polish, but Girard is a French intellectual (but spent most of his career in the US), easily available in English. I’ve recently read his Violence and the Sacred and now I want to further my understanding of his most interesting concept by reading The Scapegoat. Sacrificial violence as the root of human society, and the way to restrict our deadly natures, that I found very interesting. But Violence… was the most difficult book I’ve read in the recent years (and I still don’t have the notes Ola promised to send me 😛 ), The Scapegoat is supposed be a bit easier, and rich in historical examples. 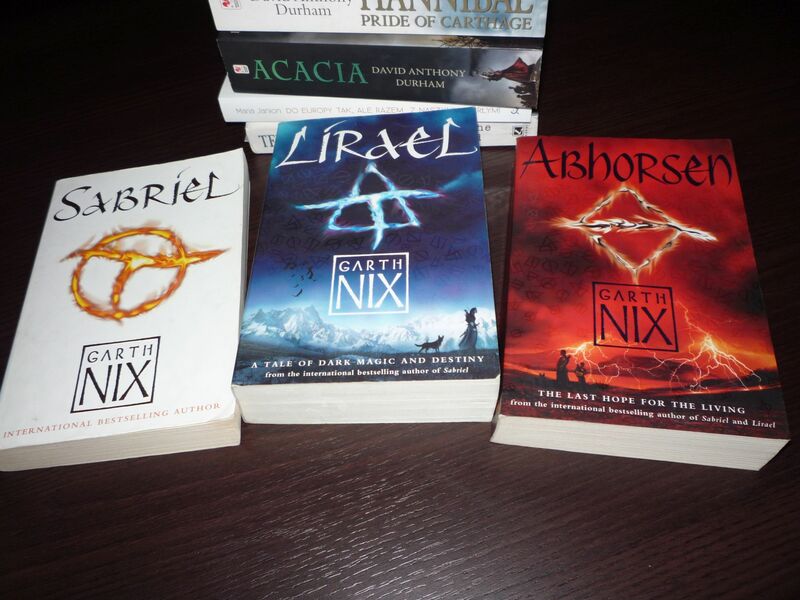 I always feel anxious when bloggers are enthused by my effusive praise of a book or series enough in invest in them, but I think you’ll at least enjoy the world building and magic concepts in the Garth Nix books. And I’m glad you’re enjoying the Pratchett essays, I think I read this before I properly started exploring Discworld and regretted it had taken me so long to get there. History is something I should get back to. I’ve Arthur Koestler’s The Thirteenth Tribe waiting for reread and review, for instance, a study on the likely origins and differences between Ashkenazy and Sephardic Jewry which received mixed reactions when it was first published. It’d be good to revisit it soon. I think I remember reading – somewhere – that Koestler’s theory has not been confirmed, I can’t remember the source. But the story of the only major, massive conversion to Judaism – by the Khazars – is fascinating! Phhh, with the proper tools and Calibre, your ebooks will stay yours and will be future proofed. Ha. Man, comparing books to cigarettes though, that is really low. I’ve always assumed Nix was middle grade to YA and avoided him as such. If you do read his stuff, I’ll be looking forward to what you think. Many apologies, Piotrek. I didn’t look properly. 😮 Still a splendid post with a super book haul. Foraging is the best attitude to take towards books! My place got crowded too from 2 decades of hording, I purged everything with a move, and now I sell all books that don’t get a solid 4 stars. Truly liberating.